Pieces listed on this page are new, made in our shop mostly to our customers specifications. This is a pair of five sided corner cabinets made for a customer for whom I've made numerous pieces of furniture, including the recently delivered sofa bed. These cabinets are 15" on the back sides, 4" on the short sides and a door about 14" wide. The height is 75" with a recessed top in case controls for future lighting is added. 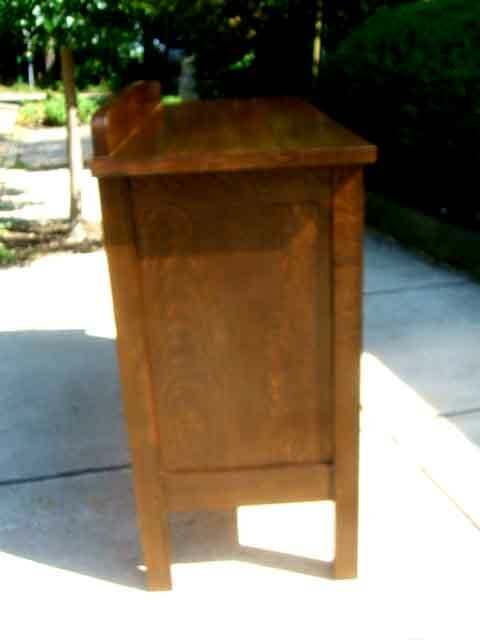 All material is quartersawn white oak with a stain similar to Stickley's Fayettville. The door pulls are also from Stickley. 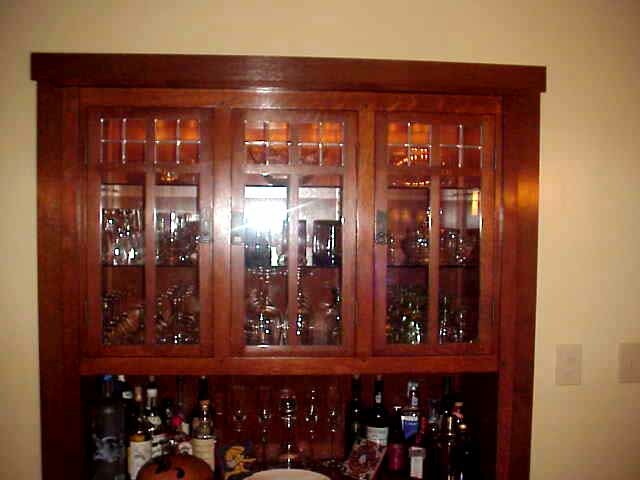 Each cabinet has 5 glass shelves, adjustable over most of the height. 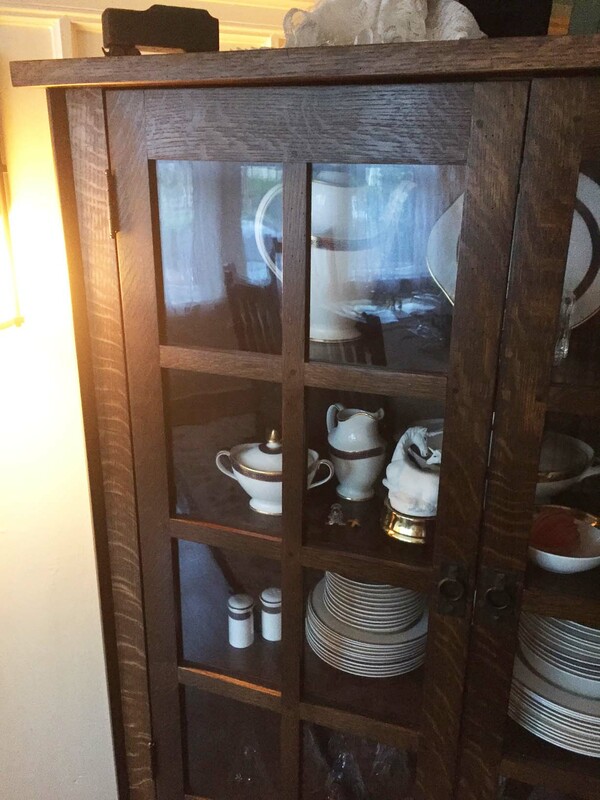 The cabinet on the left gets more light than the one on the right and has faded to some extent. 2016 price: $1,950 each. $3,750 for a pair. 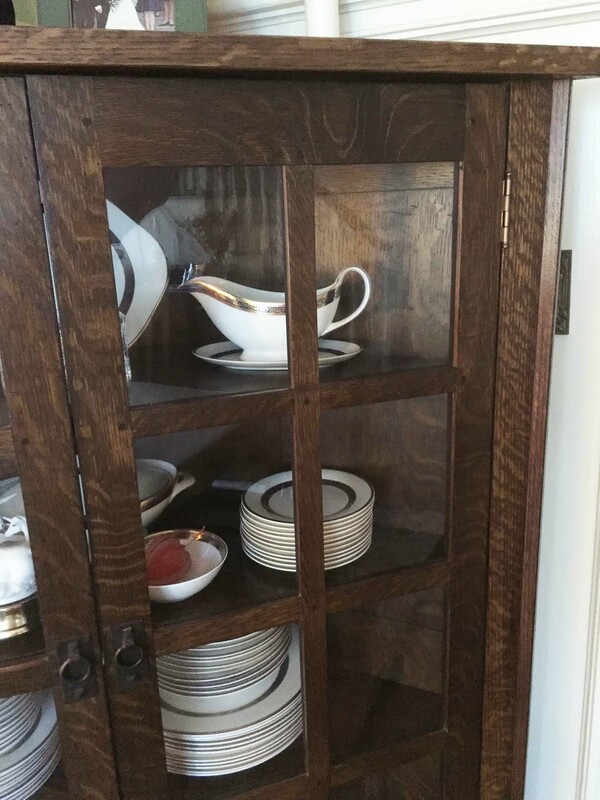 Standing over 85" high and 56" wide the top section of this china cabinet is 14" deep with three glass shelves. The three tier cornice is 58" across. 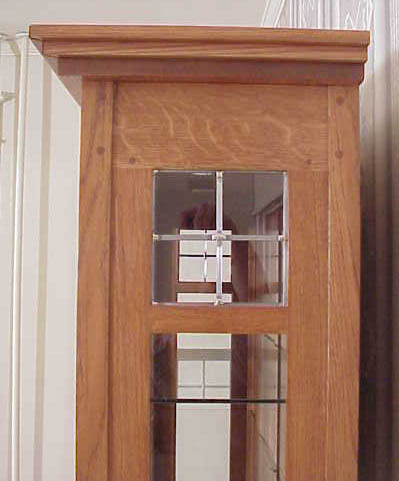 The design for the glass doors was adapted from the display cabinet shown above. The bottom section is also 56" wide but only 36" high and 16" deep. The top fits down over metal pins in the top of the lower section to hold it in place. Pegged mortised joints at every corner. 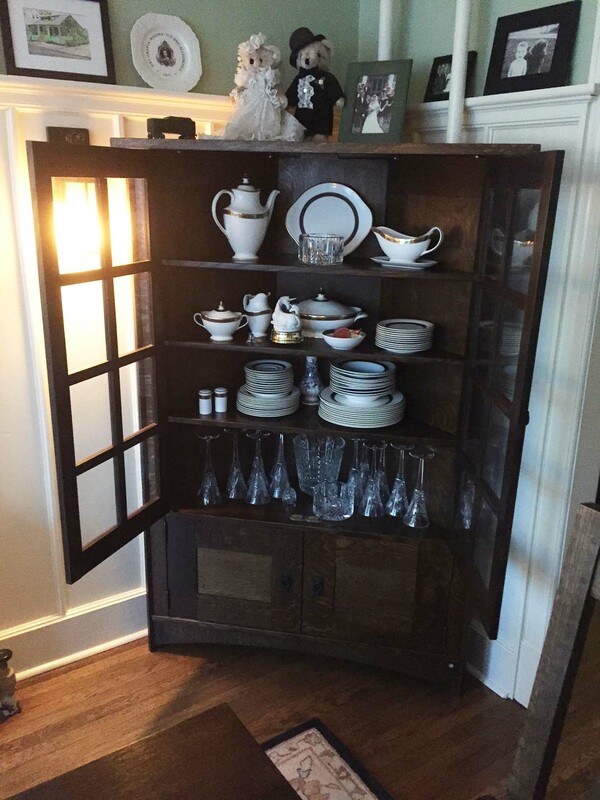 This China cabinet was originally made to be free standing like the one above and to fit into a niche in the wall. The owners had their carpenter frame it out to look built-in. 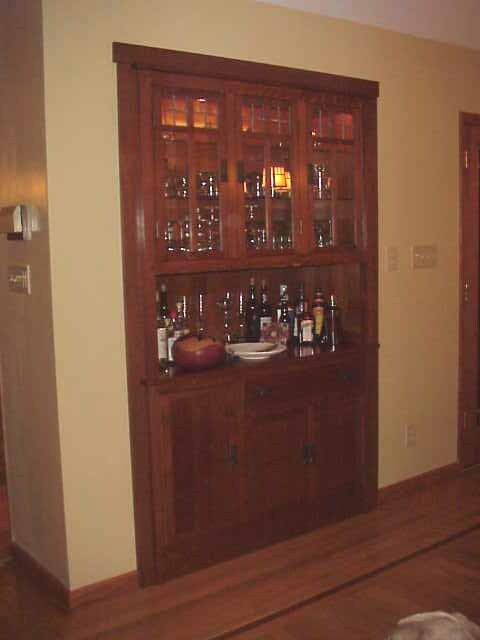 Made of solid quartersawn white oak it is a two piece unit with three doors and one drawer on the lower section, a 18' high open space on top with three doors in front of glass shelves above, with lighting. 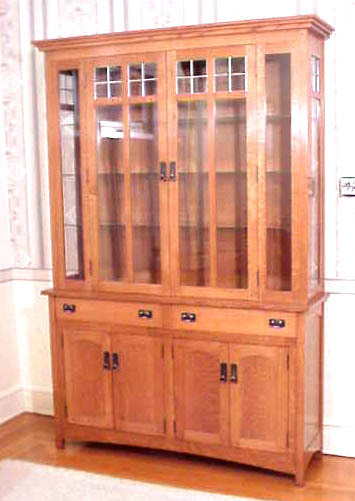 The doors were proportioned to a Stickley 3 door bookcase in an adjoining room. Stickley hardware. This is a recently completed sideboard commissioned by a couple in New Jersey for whom we built a set of 6 chairs earlier. 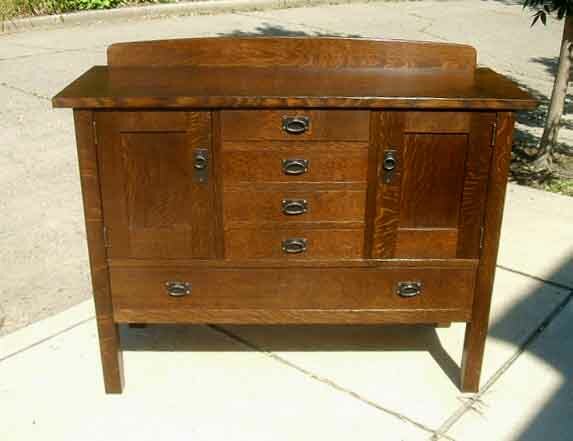 It is a reproduction of a sideboard by Gustav Stickley. The dimensions were taken from a book on building mission style furniture. It is 54" wide, 22" deep and 37" to the top. 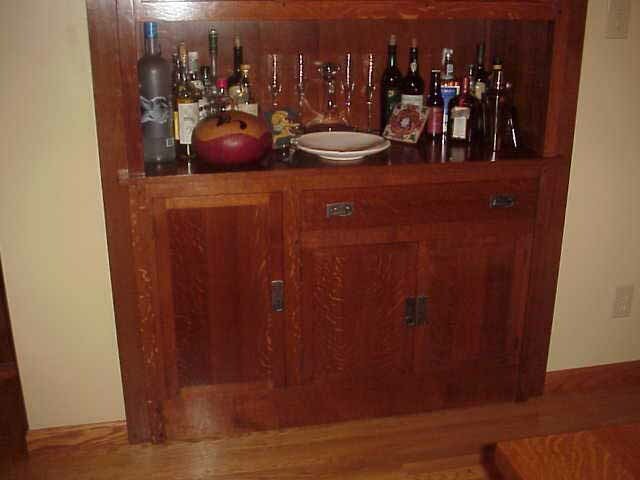 This piece is constructed of solid quartersawn white oak with an english brown oak stain. The hardware is exact reproduction of Gustav Stickley hardware secured by pyramid head nails. End panels and top are solid oak with all joints splined. Door panels are a single piece, about 9" wide. Drawers are dovetailed in all four corners. As the premier piece in our Signature Line it is inlaid with a 1/2" diameter piece of mother of pearl on the side. 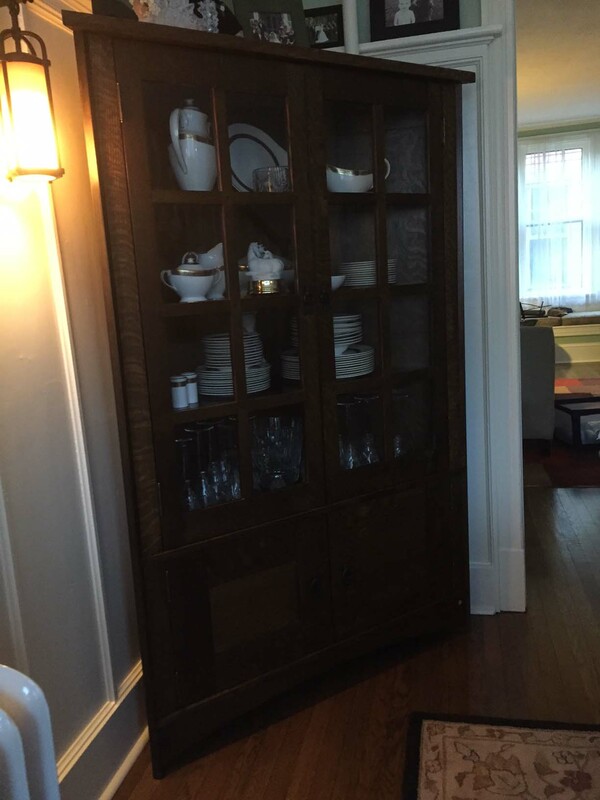 This China Cabinet was made as a companion piece to the side board above. 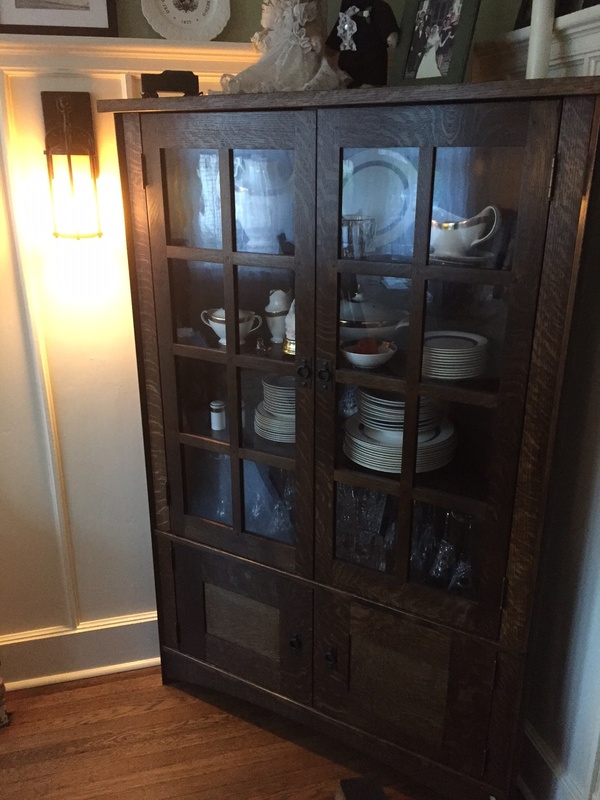 The customer built his own table and we made the china cabinet, sideboard and 6 chairs. The chairs can be seen on our newchairs page under new furniture. The 26 panes of glass are wavy original"restoration" glass made to look like the original. The dimensions were set to fit the space available. This piece was commissioned as a companion to a dining room table and set of 10 chairs which we made a few years earlier. 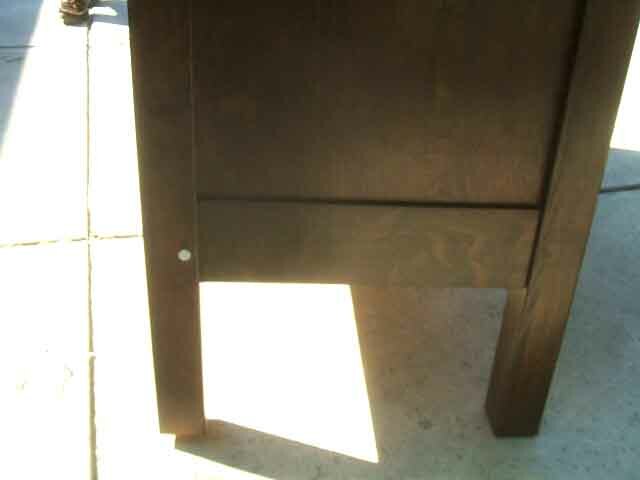 The table has the same walnut inlay pattern as the top of the sideboard and the backs of the chairs have the same inlay pattern as the backsplash on the sideboard. All structural joints are pegged with walnut pegs. The table can be found on our Dining Table page. The chairs are on our New Chairs page. The sideboard is the same color just looks lighter due to being photoed in the bright sun. It is 64" long, 40" high and 22" deep. The bottom drawer is 57" wide by 6" high and 18" deep. Stickley pulls.